Anyone remember that debate on a Seinfeld episode? Jerry is given a suit by his "friend" Bania and in return owes him a meal. However when they go out Bania orders soup saying that he'll save his meal for another time. It goes on and on with Jerry insisting that this is the meal and there won't be another chance while Bania demands that soup is not a meal. Hysterical!!! Aah Seinfeld, the best show about nothing!! 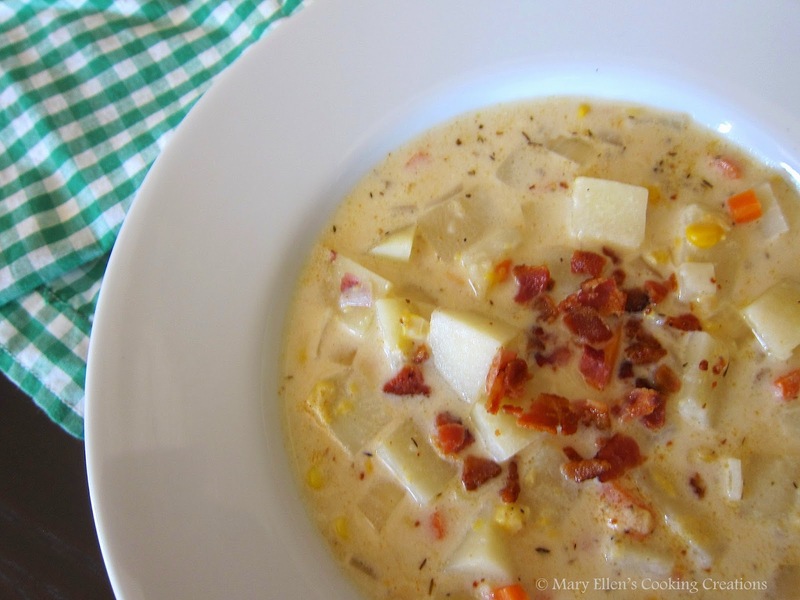 Anyway, I have to agree with Jerry - soup IS a meal, especially when it is a hearty soup like this Potato Corn Chowder. I have made several chowders so I took my favorite things about them and created this chowder. Bacon is a must for me when starting a good chowder, and I love saving it to use as a topping for serving. Heat your stock pot or Dutch oven. Add the bacon and cook until crisp. Remove from the pan (crumble and keep for topping) and leave 1 Tbsp bacon grease in the pan, discarding the rest. Add the creamed corn, frozen corn, touch of salt, pepper, thyme, and cayenne. Stir everything and then add the broth slowly - you may not use all of the broth. You want your veggies covered but not lost in the broth. You can always add more if you need it. Bring to a boil and then reduce to a simmer for 15-20 minutes until the potatoes have cooked through. Lower the heat and add the cream; let simmer for several minutes. Taste and adjust salt and pepper if needed. Serve topped with crumbled bacon and shredded cheddar cheese.